There are dark and brooding red wines, light and joyous red wines, and everything in between, and all can be delicious and satisfying - they all have their place. Poulsard, though, exists almost outside of the spectrum of red wine. As far as I know, Poulsard is vinified only in the Jura region of France. The grapes are relatively large and therefore have a low skin to juice ratio - the opposite of what is prized in say, Burgundy Pinot Noir. And the skins are not heavily pigmented. The resulting wine tends to be light in color, almost like a rosé. But don't be fooled by the light color as these are, when well grown and well made, powerful and structured wines with great depth of aroma and flavor. Unusual aromas and flavors, too. The fruit veers towards pomegranate, red currant, cranberry, and blood orange. That sounds precious because it's so specific - but I promise you that it is true. I often find dried roses on the nose, in addition to those same bright fruits, and sometimes a salty, chalky bass note. Perhaps I haven't had enough experience with the wines, or maybe I'm just missing something, but I find that the wines are more about fruit and particularity of structure than they are about minerals and earth. The structure can be surprising, by the way, because it is firm, while the wine appears to be so light and delicate. 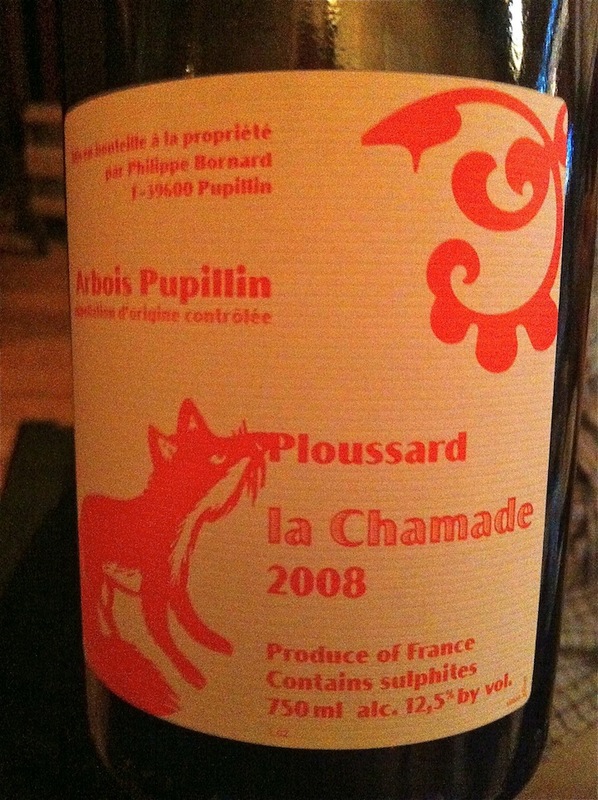 I love drinking Poulsard because it is such an aromatically expressive and spare red wine. It isn't a wilting lily - it's not delicate, exactly. A good Poulsard can stand up to mushrooms, steak, and other earthy hearty fare. But there is no extract, really, nothing other than the essence of the thing. This analogy is overused, but here I think it fits - Poulsard can be Burgundian in its melding of finesse, grace, and power. I misunderstood good Beaujolais for a few years because the wines are so brightly acidic and fresh. I thought of it as a light wine. Beaujolais can be joyous and light in body, but Morgon, Moulin-a-Vent, Fleurie (well, maybe Fleurie), these are not light wines. They are deeply and darkly fruited, and rich next to a Poulsard. I would drink Morgon with blood sausage, but not Poulsard. The best Poulsards I've had are thrilling, but the problem is, the best Poulsards are quite hard to find and drink. I feel comfortable saying that Pierre Overnoy/Emmanuel Houillon make the finest Poulsard, and although Louis/Dressner imports the wine to the US, we're talking about a handful of cases for the US. I was able as recently as the 2007 vintage to walk into Chambers Street and buy this wine on the shelf for under $30. Those days are gone forever. Now the wine is just not seen on shelves, in NYC anyway. 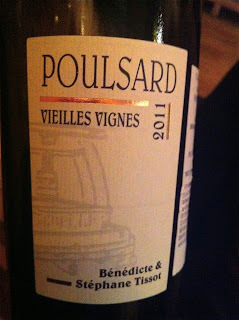 Another favorite for me is the Poulsard made by Domaine Ganevat, whose wines have also become rare and dear here in NYC. Not long ago I found myself craving Poulsard and I realized that I haven't had a bottle since the end of 2012 at this amazing dinner in Stockholm. 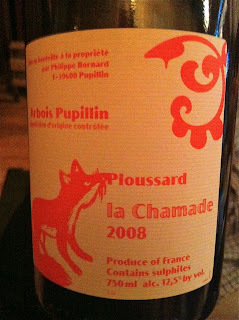 I knew that I would buy and drink Poulsard, but which one? 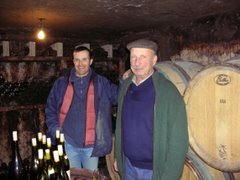 What should I be drinking, if I'm not drinking Overnoy or Ganevat? I decided to gather a few friends who also appreciate the glory of this very light and strange grape, to buy every Poulsard we could find, and drink them together over dinner. 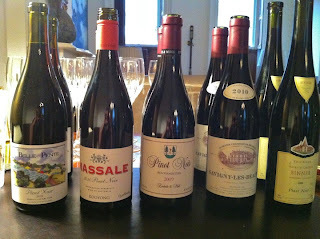 Three years ago I did a small Poulsard tasting and there were 5 wines I found to include. 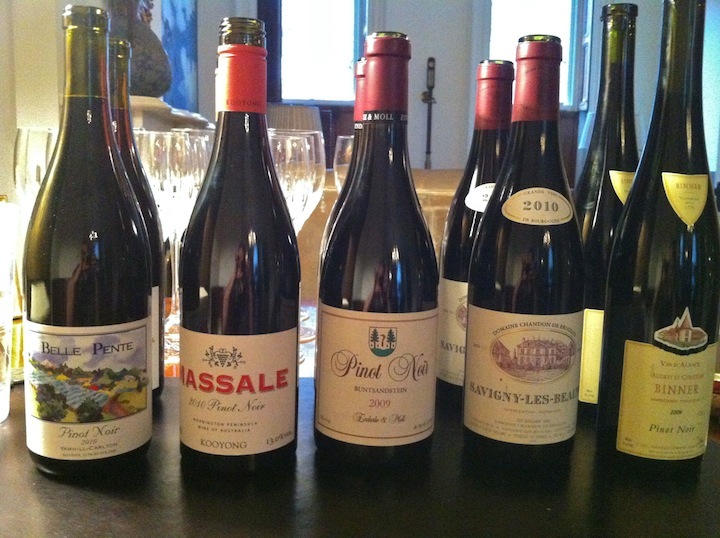 Last week I found 11 wines and chose to include 9 of them, and this excludes Overnoy and Ganevat. This probably reflects the rising popularity of Jura wines in general, and also the diligent work of several importers, and people like Sophie Barrett of Chambers Street Wines, who believe in the wines and want to offer them to curious customers. I'm sorry to say that on our recent Poulsard evening all of the tasters were a little bit underwhelmed by the wines as a group, but we agreed that a few of them were quite good. I've always found that Poulsard is reductive and funky when first opened, and does much better when decanted. And so we decanted our bottles and drank them slowly with a feast of Middle Eastern food. Following are my impressions, but I want to mention that some of the wines that did not impress me on this night were better on other nights, in different vintages. All of the wines cost between $20 and $30, and are currently available on (some) NYC shelves. 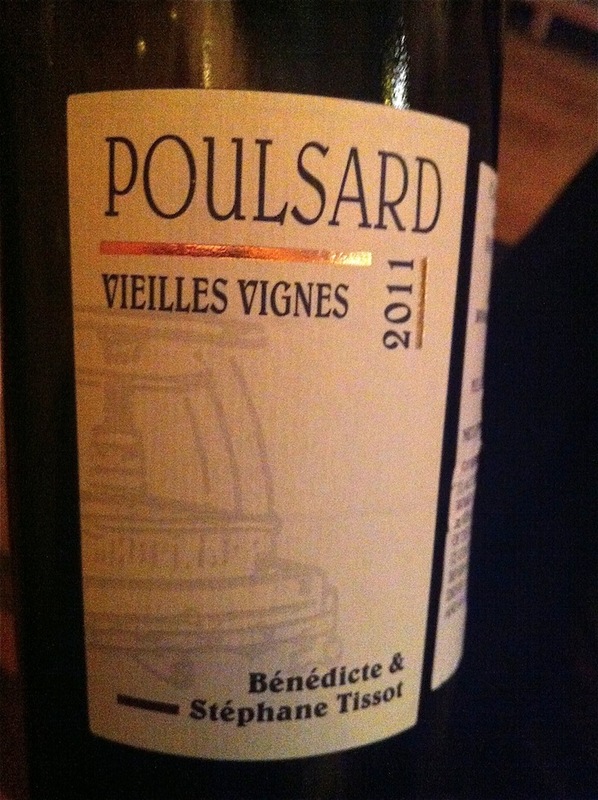 2011 Tissot Poulsard Vieille Vignes, imported by Camille Rivière. I thought this was the most complete of all the wines. It showed true Poulsard character with expressive and bright red cranberry and blood orange fruit, slightly rose inflected, and it showed the depth, balance, and structure that old vines can bring. It held up beautifully on the second day. I haven't loved Tissot's wines in the past, but this was a really good wine and I would happily buy it again. I was more excited about this wine than some, but everyone liked it. 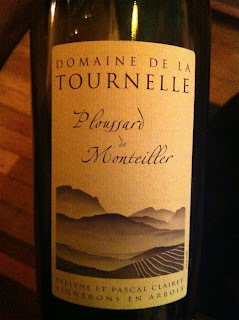 2006 Domaine de la Tournelle Ploussard de Montellier (Poulsard is sometimes called Ploussard), imported by Jenny & François. This is the current release of this wine in NYC - maybe they are released late everywhere? Overall I think the 2004 was a greater wine, but this is truly lovely, with good balance and resonance, and honest Poulsard character. 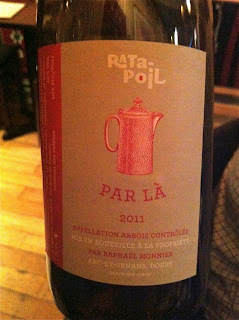 Others were more excited about this wine than I was, but I also liked it very much and would happily buy it again. 2011 Michel Gahier Ploussard, imported by Neal Rosenthal Wine Merchant. Delicious wine, deeply flavored and balanced, well structured. Again there was no controversy here - everyone liked the wine. No one was super excited about it though, and for me, that is because it didn't show the typical Poulsard flavor package that I crave. But it was very good wine. 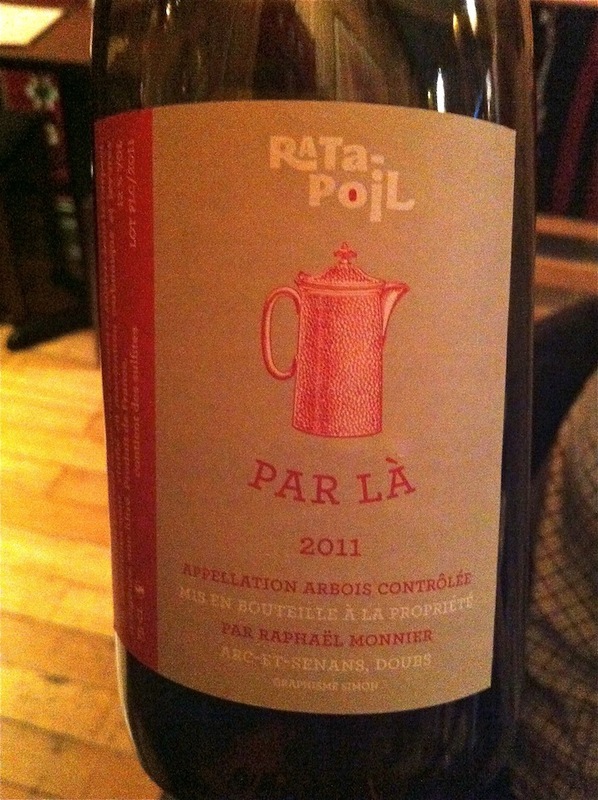 2011 Ratapoil Ploussard Par La, imported by Selection Massale. This wine was fresh and pretty and I enjoyed drinking it, but I found it to be lacking in complexity and it didn't hold my interest in the end, even when we revisited it later in the evening. Certainly a pleasing and lovely wine, but it didn't satisfy my craving. A very good value within the group, and one taster really liked the wine - so probably this is worth trying if you haven't already. 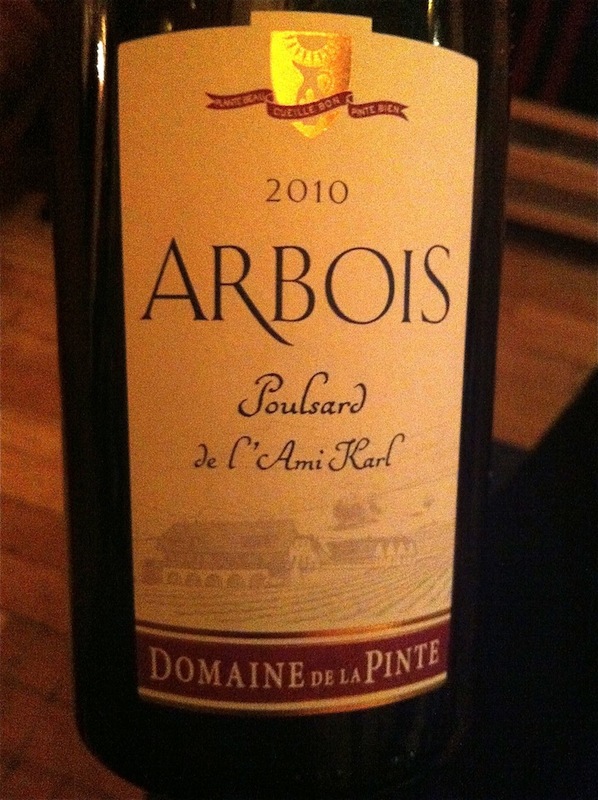 2010 Domaine de la Pinte Poulsard de L'Ami Karl, (bottle gone before I noted the importer - sorry). I've had this wine before and I liked it, but on this night I was the only one sticking up for it, and that's probably because I liked it in the past. The aromas were vastly different from the other wines, showing things like red grapefruit, and one person suggested that it might be yeasted. 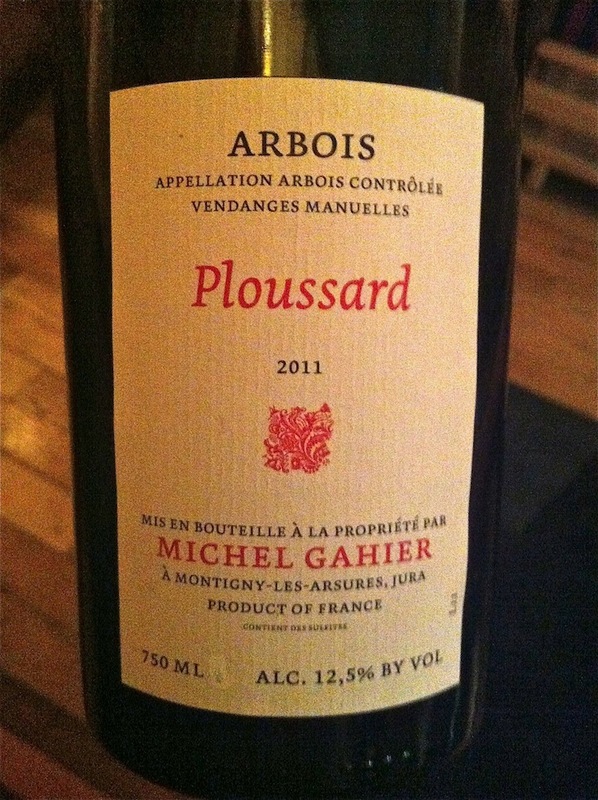 It did show aromas that are not typical of Poulsard, but it was bright and snappy wine. I'm reaching here - it wasn't so great on this night, and it was worse on the second day. 2011 Domaine de Montbourgeau Côtes du Jura Poulsard, imported by Neal Rosenthal Wine Merchant. I was surprised at how this wine showed because 1) Montbourgeau makes great wine; and 2) the Poulsard, while not the shining star of the Montbourgeau lineup, is still quite good. This wine was so forward and candied in its fruit and it didn't feel balanced, or all that interesting. But it was drinkable and pleasant for whatever that's worth. 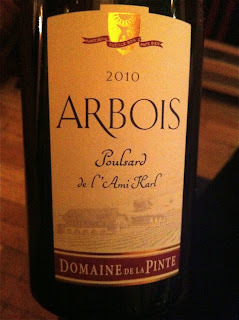 2010 Puffeney Arbois Poulsard, imported by Neal Rosenthal Wine Merchant. I don't know...Puffeney is "The Pope of the Jura," and I respect him immensely as a producer, and love his Trousseau, but I don't think I'm a fan of his Poulsard. This one was candied fruit and awkward, not rewarding. 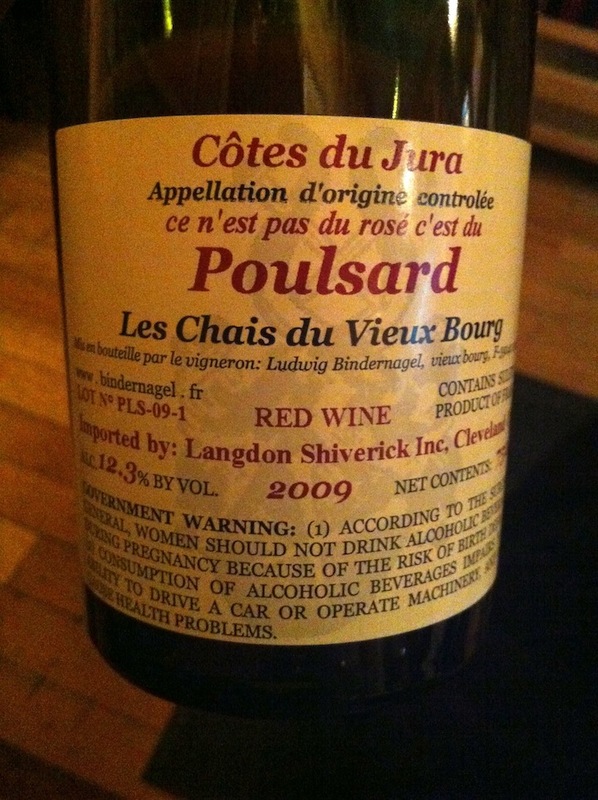 2009 Le Chais de Vieux Bourg/Bindernagel Côtes du Jura Poulsard, imported by Langdon Shiverick. This was simple in its candied strawberry fruit, not well balanced, and not typical of the Poulsard flavor profile. It was worse on day two. 2008 Bornard Arbois Poulsard la Chamade, imported by Savio Soares. I was once quite excited about Bornard's wines, but after a series of weird and unhappy bottles, I stopped buying them. This one was undrinkable, I thought. 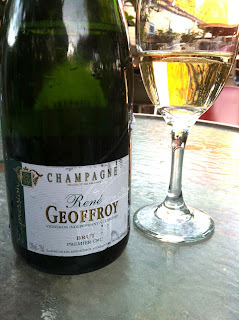 It was vaguely fizzy, candied, without structure, and as one taster succinctly said, dirty. Sadly, our bottle of 2011 Domaine des Marnes Blanches, imported by Selection Massale, was corked. Enderle & Moll - Great German Pinot that Should be Imported to the US, but isn't Anymore. This past weekend I held a small tasting for some parents at my younger daughter's school. It was something that I donated (with generous support from Chambers Street Wines and Slope Cellars). The theme was Pinot Noir from various parts of the world. We tasted some very good wines, including Champagne by Brigandat, a Chandon de Briailles wine, a Belle Pente wine, and others. All of the wines cost between $30-40. There were no duds in the tasting - everything was good. One wine, however, was head and shoulders above the rest in terms of quality - the 2009 Enderle & Moll Pinot Noir Buntsandstein. Binner's 2009 Alsace Pinot Noir was all about fruit and while it was good drinking, it was not complex enough to hold my interest, nor did it distinguish itself in terms of terroir expression. I felt it would have been a better wine had the fruit been harvested earlier. 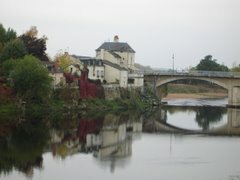 Chandon de Briaille's 2010 Savigny-Les Beaune showed finesse, and a lovely balance of ripe fruit and subtle earth tones. Sandro Mosele's 2010 Pinot Noir Massale the Kooyong in southern Australia had interesting feral animal aromas but also felt a bit roasty to me. Belle Pente's 2010 Yamhill/Carlton Pinot Noir was very tasty and nicely balanced, but did not offer much in the way of complexity, which is understandable in a wine made from very young vines. Enderle & Moll's wine was world class. It shows that perfect combination of light body, finesse, and pungent aroma and flavor, and a finish that feels tactile on the tongue, and really lingers. The aromas involve red and dark Pinot fruit, but also pine and other foresty smells, and the wine moves across the palate in that light, deft, and powerful way that comes with well tended old vines. The wine is delicious now but seems to me to have the kind balance and acidity that indicate good potential for improvement in the cellar. Okay, so now you know that I really liked the wine. I wrote about another of Enderle & Moll's wines last year - I loved that one too. Dan Melia (or Dan Amelia, as my daughters call him - you can choose because he's fine with both) and Lars Carlberg, when they ran Mosel Wine Merchant, brought Enderle & Moll to the US. It's not like the wines sold like hotcakes, but red wine wasn't really the point of their portfolio. They sold enough, and there's hardly any wine anyway. When Mosel Wine Merchant was retired, its producers were snapped up lickety-split by some of the juggernauts of the New York wine sales landscape (Louis/Dressner, Grand Cru, vom Boden, and so on). No one is importing Enderle & Moll though, and I'm no wine economist, but I cannot imagine why this is. The wines are cheaper than most villages level Burgundy and compare quite favorably with even the best villages level Burgundy. These are excellent and distinctive wines, and they happen to be farmed and made in a healthy way. I hope that one of you importers out there, or one of you enterprising wine store owners, sees the light on Enderle and Moll, and takes the wines in before Diageo grabs them. Here is Lars Carlberg on Enderle & Moll. Here is the Enderle & Moll website. It's in German, but you'll be able to see immediately that it's about wine. I promise, I will be your first retail customer. 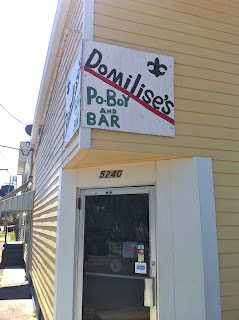 I went to Domilise's for the first time. It's in the uptown neighborhood but not far from the river. 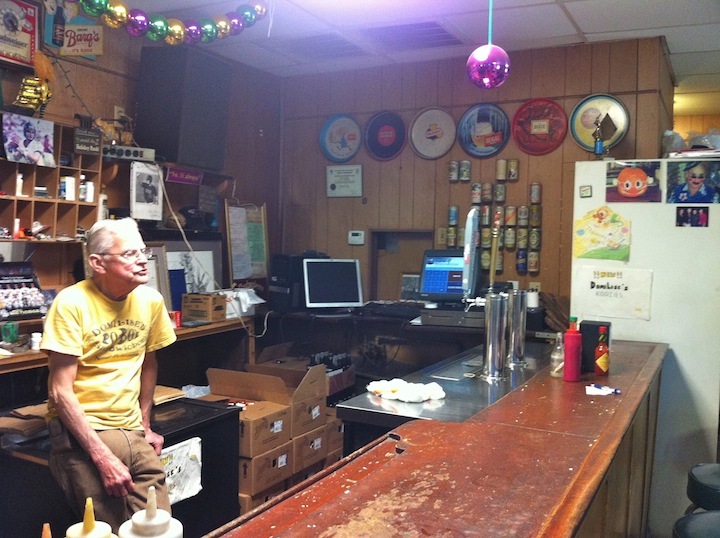 The man behind the counter said that it opened over 100 years ago as a bar, serving mostly the fellows who worked on the river all day and wanted a drink afterwards. It's been in the family since then, the wife of the man who opened it would cook for the patrons, and it caught on that her cooking was good. If I were forced to choose only one, I would say that this is the very finest sandwich that I have ever had in New Orleans, and that's saying something. Domilise's fried shrimp po'boy was a thing of beauty. Copious amounts of very fresh sweet shrimp, fried but not too much, not past the point of crisp crust and succulence inside, dressed with lettuce and chopped pickles and a swab of their version of remoulade. I don't really know what else to say here - this sandwich is a masterpiece in Domiliese's hands. 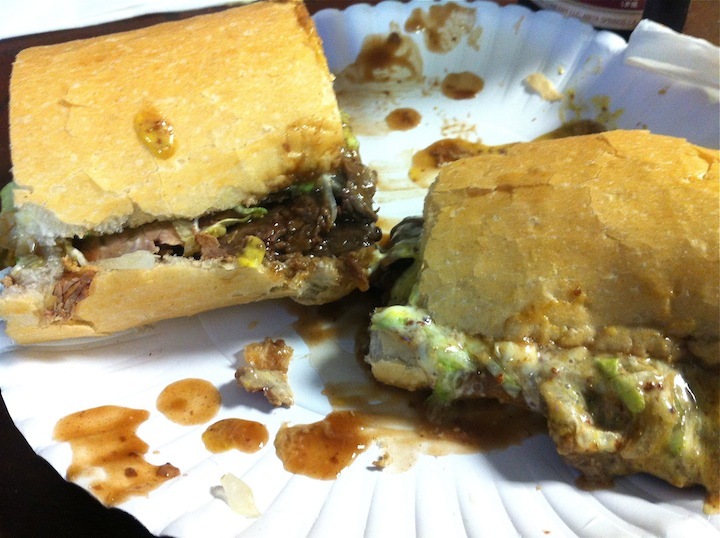 Domilise's roast beef and gravy po'boy is excellent too, and most assuredly in the messy style. 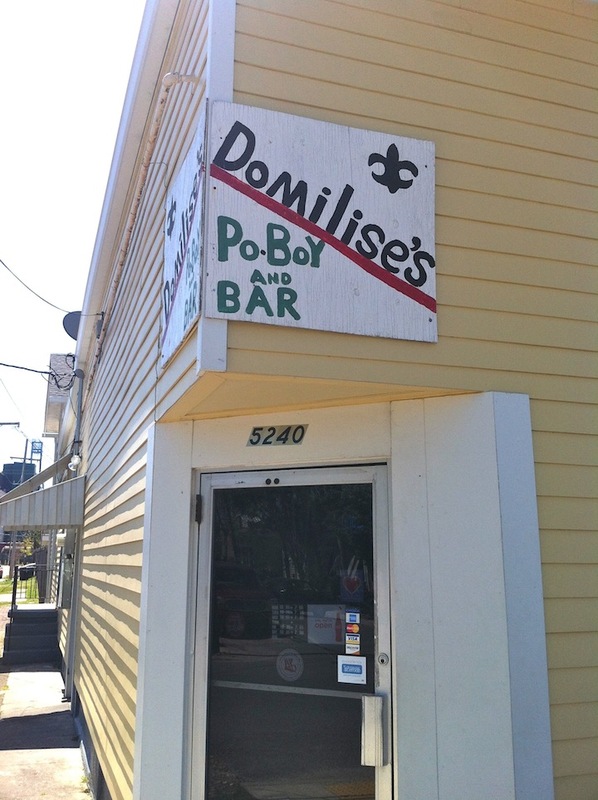 Domilise's is not the only great shrimp sandwich in New Orleans, not by a long shot. 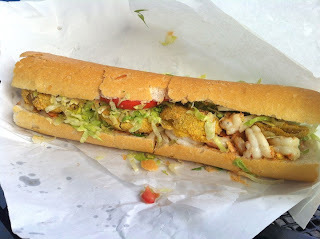 This beautiful shrimp and fried green tomato remoulade po'boy comes from Mahoney's, uptown on Magazine Street. 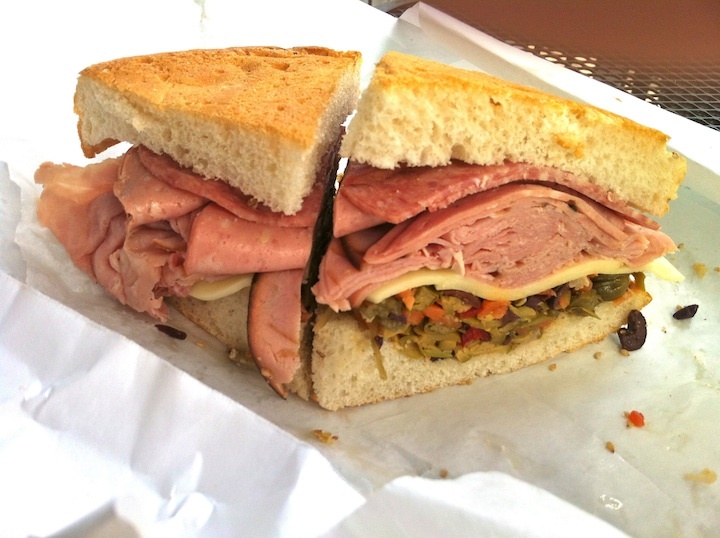 Mahoney's also makes a fine Muffaletta, the New Orleans classic sandwich with Italian roots - salami, mortadella, and other cold cuts on round sesame seed bread with a generous layer of chopped pickled vegetables. Hard to argue with that. But to return to the beautiful sweet gulf shrimp of New Orleans, I also ate them for breakfast one day at Ruby Slipper in Mid City. 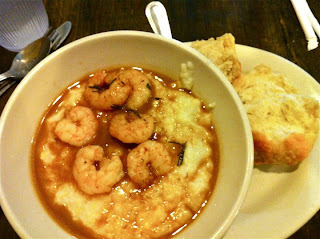 Really this dish is about the grits, which were creamy but retained a lovely grainy texture. 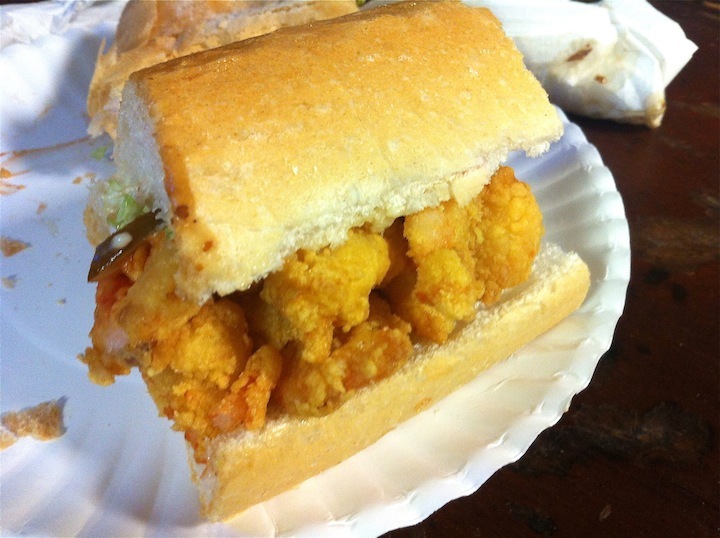 Topped with fresh gulf shrimp, this is sweet and savory paradise. 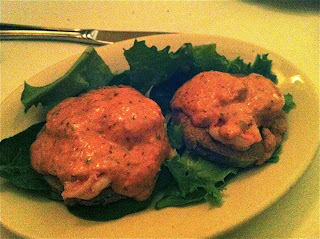 And at the delightfully old school Uptown classic The Upperline, I enjoyed fresh gulf shrimp remoulade over fried green tomatoes. This remoulade was made with a lot of whole mustard grains and was very delicious. I love all of the different remoulade interpretations in New Orleans - that could probably be the subject of a book. 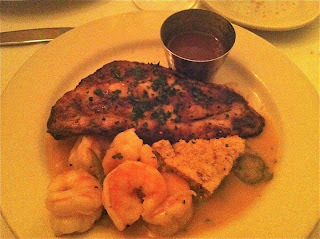 Gulf drum fish was also very good at Upperline, although not as wonderful as the shrimp that accompanied it, which were meant to be dipped in a somewhat spicy habenero pepper sauce. It wasn't all gulf shrimp, although I would sign up for that today. 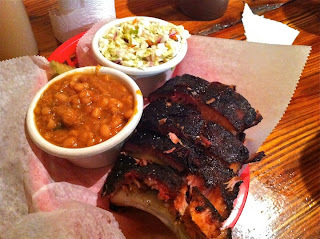 New Orleans boasts one of the better BBQ joints I know of (disclaimer: I have never been to Texas, Kansas City, or St. Louis), called The Joint. They make very compelling ribs, indeed. Great home made baked beans too. Yes, New Orleans draws tourists for Jazz Fest and plenty of other things, but to me it is a city that is worth visiting even if only to eat and drink. La Bolorée is an unusual wine. 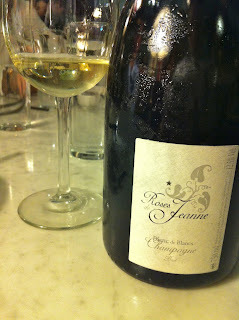 It is an old vines Pinot Blanc grown on chalky soils in the Aube, there's nothing else like it. It was very smokey and mineral, and quite rich with honeyed flavors on the finish. I appreciated the quality of this wine but it was my first time drinking it and I must say that I didn't really understand the wine, it was simply too far away from what I know of the aromas and flavors of Champagne. I'd love to drink it again, but this is not an easy thing to do as quantities are small and the wine retails for about $175. I've since had the wine twice, and it is a curiosity, for sure. The only pure Pinot Blanc Champagne that I know of, it is quintessentially Bouchard in its clear expression of terroir and its purity of fruit. That time I drank it in August, 2011 at the Bouchard dinner, for me it got lost among the other wines. It is a wine that I imagine would show terribly at a tasting - people would be left shaking their heads at how a wine like that could cost so much money, at how capricious the Champagne hipsters are. But the thing is, La Bolorée is a great wine. It's also an unusual wine, a Champagne that shows aromas and flavors that have no bearing on what we think of as "normal." It is herbal and green. Not green as in under ripe, green as in tarragon and chervil, green as in the forest in springtime. The wine thrives on its almost impossible fineness of texture and flavor, not on fruit or anything else that's expected or easy for us to latch onto. Honestly, the wine just doesn't taste like any other Champagne. And so, it is easy to miss why this is a great wine. Peter Liem, a huge proponent of Bouchard and of this wine before it was introduced to the US, generously opened a bottle this past xmas. Drinking it over a few hours without other wines next to it that would speak louder, I think I understood it. And then on this recent evening even though a few other wines were present, I appreciated it even more, the way its vibrant herbal flavors were layered on a gossamer old vines frame. 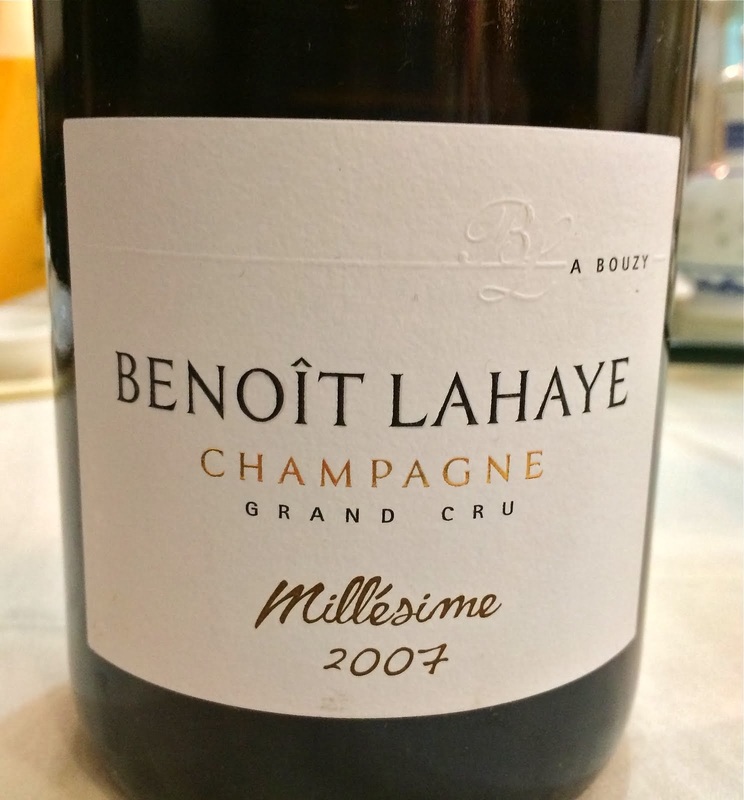 It seems to me that if one were to draw a large rectangle that contains the world of Champagne, one of the corners of the rectangle would be occupied by this wine - it represents one extreme possibility. On another recent evening I was in New Orleans at the wonderful Bacchanal, a wine store and bar/restaurant where one can buy a bottle and take it out to the garden in back, order some good food, listen to some shockingly good jazz, and feel happy to be alive. I wandered through the shelves and came upon a bottle of wine I hadn't had in quite some time, René Geoffroy's Champagne Brut Expression. I really like Geoffroy's wines from top to bottom - they are so expressive and joyous and generally offer a great value dollar for dollar. This one was disgorged in 2010, so I figure the base wine is 2008. I was charmed immediately by the harmony of fruit, earth, and vivid chalkiness on the nose and the complexity, particularly on the finish. So much so that I snapped a picture and sent it to Peter, bragging about my outdoor wine affair. I thought about this wine over the next few days and resolved to buy some. I mean really - a wine with such such a pure chalky expression of such lovely Pinot fruit, for under $50? I asked Peter if the 2010 disgorgement indicates 2008 as the base wine, and he said that it might be but that there is always a lot of reserve wine here too. Wait a minute! Reserve wine? I thought that Expression is made from a single vintage, but not aged long enough to be labeled as a vintage wine. That's when I realized that the wine I thought I was drinking was an entirely different wine! I mixed up Empriente, the almost purely Pinot Noir single vintage wine, with Expression, the wine that is typically comprised of about 50% Meunier, and perhaps 40% Pinot Noir, the rest Chardonnay. One explanation here is that I have no idea what I'm drinking, and cannot tell Pinot Noir from Meunier, or my a$$ from my elbow. This is entirely possible, perhaps likely. But I prefer to think that the undeniably chalky essence of both wines renders moot the particular cépage. And that the richness and complexity conferred by the high proportion of reserve wines in Expression allows it to feel just as grand of a wine as Empriente. Seriously, this wine is all about chalk, richness of fruit notwithstanding. This is something that I didn't understand about either wine until now. If there is a lesson here, aside from the fact that I can be an absent minded schmendrik sometimes, it's that no matter who we are, no matter how often or how grand the wines we drink, it's all too easy to miss the point, to be off-base about things sometimes. Best to allow for that possibility and not to shout too loudly about opinions, and to try to find value, even, in being wrong.